The 2014 AmericanMuscle Car Show was a major success with a lot of amazing Mustangs and amazing people! This year we had more Mustangs than ever before at the show, more giveaways, and more charity than we could have ever expected. The AmericanMuscle Car Show was a monumental success this year; we raised $35,503.02 for the Special Olympics charity. The Red Mustang Registry deserves a special shout out for donating $4,300 of that total to the Special Olympics as well. 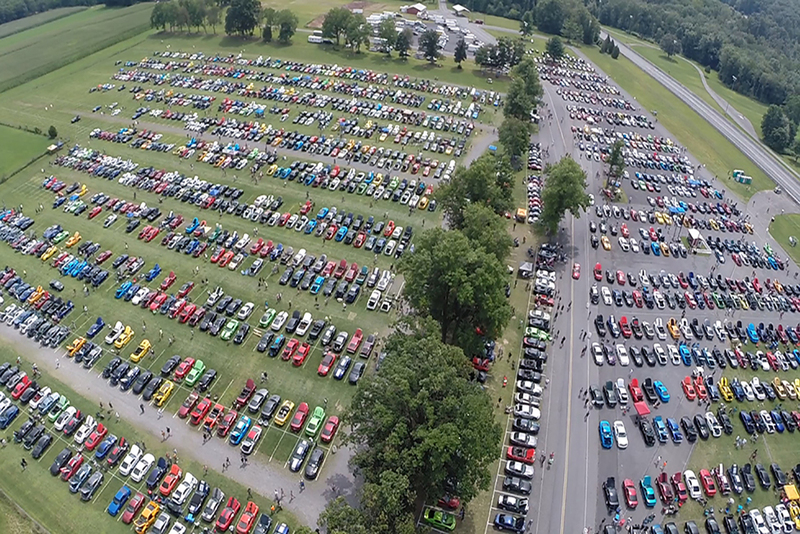 The day of the show itself was a perfect one between the weather, the 10,000+ people, and the excitement to take part in the Mustang Heritage. When arriving upon Mohnton, Pennsylvania, Mustangs where feeding in from all the surrounding roadways to the Maple Grove Raceway. The lopey-idle of large cams, deafening revs from long tube headers, and the sound of boost building filled the air from morning until evening; Mustangs as far as the eye could see decorated the lush green landscape all around the raceway.The final count was at 2,600 Mustangs in the show and more in the parking lot. Mustang fans of all ages and affiliations communed at Maple Grove to share their interest and passion for the Ford Mustang, which consequently attracted Mustangs from all different eras, areas, and purposes to congregate on the show field. Some high-profile Mustang celebrities such as Vaughn Gittin Jr, Chip Foose, and Brett Wagner were present at the car show as well, engaging fans in conversation and signing autographs. There was a lot that happened at #am2014 and below are some of the highlights of the memorable day. Professional drifter Vaughn Gittin Jr. was in attendance of the show with his RTR team. Vaughn signed autographs and talked to fans for hours, while his line of Mustangs were on display. One of the most exciting highlights of the show was the 2015 Mustang RTR reveal. The public was able to see, for the first time ever, the 2015 RTR rendering; needless to say the #2015RTR got a lot of people talking and built up even more hype for the 2015 Mustang. The 2015 RTR will be a continuation of the highly successful and unique RTR line that is the brain-child of Vaughn himself. Vaughn’s pick of the car show was Rob Rabon’s 2011 bagged, blown, and dipped GT, which has won twice now. One of the big name guests at the AmericanMuscle Car Show was car personality and hot rodding legend, Chip Foose. Chip signed autographs at the Magnaflow booth for hours, staying past the show closing to sign autographs for fans. Chip announced the winner of Project MMD; 19 year old Zachary Villareal from Alice, Texas was the lucky winner of our 2014 GT SEMA show car. Zachary was over-whelmed with the news that he was the winner of Project MMD and could not have been more excited to receive the keys from Chip Foose. After Chip handed the keys over to Zachary and he had the chance to sit in his new Mustang, it finally set in that he was taking that car home. Chip has a special announcement of his own; he is going to be building the next SEMA Mustang with the MMD team, that will be given away at next year’s AmericanMuscle Car Show. The host of the hit show Pass Time and many other car shows, Brett “Big Schwag” Wagner, was at the AmericanMuscle Car Show as one of the hosts. AmericanMuscle’s video host, Justin Dugan, and Brett Wagner walked around at the show and hosted many of the events for the day. The “Big Schwag” really brought a true sense of automotive enthusiasm to the show with his love for Mustangs and helped to raise the level of excitement at the show. One of the incredibly unique attractions at #am2014 was the tattoo booth on premises. Fans of AmericanMuscle could pick out a tattoo design of their choice and get a free tattoo done right there at the show. Before the morning was over all of the time slots had been filled up to have tattoos done. Many Mustang owners and enthusiasts left the AmericanMuscle Show with some fresh ink. What would a Mustang show be without a combination of exercising the exhaust, the tires, and the engine? #am2014 held three competitions: a Roush sponsored burnout competition, a BBK Sponsored revving competition, and a BAMA sponsored dyno competition. The burnout contest brought a wide-range of competition and a lot of white smoke pouring-off of rubber. The main highlights from the burnout contest were a 2011 – 2014 Mustang GT doing a massive burnout, yet over-heating and catching fire, and a Push Rod 5.0 swapped New Edge Mustang drift car doing a massive burnout with a figure 8 thrown into the middle of the burnout. Needless to say, the New Edge Drift car took home the prize. The BBK Revving competition was hosted by Brett “Big Schwag” Wagner and saw a range of Mustangs from Fox Bodies to new coyote S197s. The Big Schwag brought his trademark personality to the competition, making the growling and screaming coming from the different exhaust setups that much more enjoyable. Taking home the prize was 2011 – 2014 coyote which sounded fierce. Something about those 4 valve engines just sounds so good. The Bama Performance Dyno competition had everyone overwhelmed with power; every car that went on the rollers put down huge numbers that would smack down any Camaro. Once again, the coyote engine was out in force and taking awards. A 2014 GT with a massive turbo threw down a baffling 926 HP while spinning on the dyno. That is an insane amount of power to begin with, yet it is not even an accurate number since it was spinning on the rollers. ll in all, it was an incredibly memorable day with cars, events, and announcements that will have the Mustang community talking until our next car show. We would like to thank not only our sponsors but also our loyal customers who helped to make the car show what it was. What were your favorite moments of #am2014?